Leading up to Forest Park’s founding, the lake was largely swampland. The St. Louis Post-Dispatch paid 6,000 men to expand the lake and make it suitable for boating. Post-Dispatch Lake has since been expanded again for ease of access to the Grand Basin and for the inclusion of an island just for wildlife. One of the satisfying things about paddle-boating is that it takes some work, too. Now, it’s not difficult, but it requires the same persistence as biking and begs the same attentiveness as bird watching. In fact, paddle boating for me became a mixture of those two pastimes. In my experience, the work involved enhanced my enjoyment. Spending an hour paddling under the bright sun allowed me to look around and actually see the egrets gliding overhead, the leafy moss in the shaded lagoon west of the Grand Basin and the trees on the brink of embracing their fall hues. And when I listened closely, I heard the high-pitched whistle of the Emerson Zooline train, the low hum of the happily distant insects and the steady spray of the Grand Basin water fountains. After I shoved off — or rather, pedaled off — from the Boathouse in the direction of Government Hill, I worked those wheel rotations as if I were in a race. I paused to appreciate the World’s Fair Pavilion, built five years after the St. Louis World’s Fair on the site of the Missouri State Pavilion, which burned 12 days before the end of the seven-month fair. But once my boat started drifting, I pedaled away again. I steered my boat through a tree-rimmed canal, under a footbridge and out of the shadows into the expanse of the Emerson Grand Basin. Egrets and ducks joined me as I boated past the fountains, looking up Art Hill at the Saint Louis Art Museum. 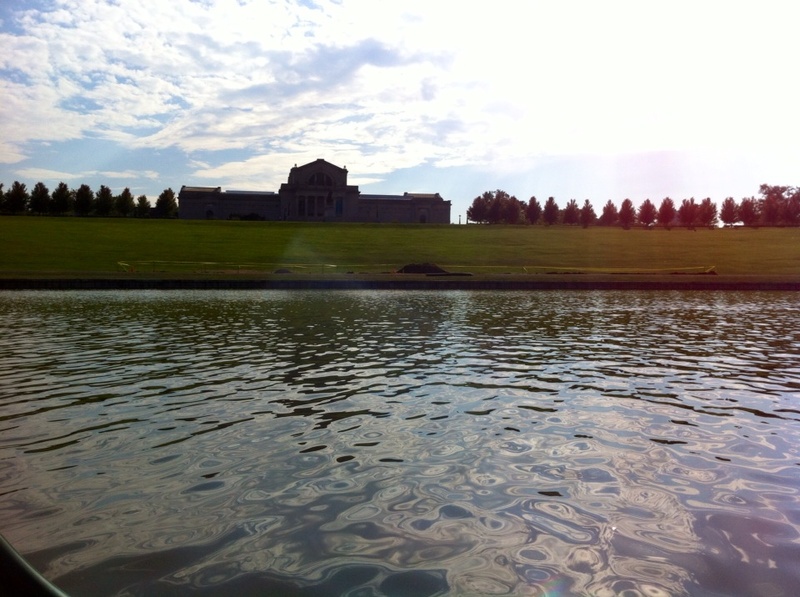 Just the sight of the museum — one of my favorite places to be in St. Louis — triggered happy memories of the summer. Strolling through the Impressionist France exhibit … watching the sun set and the full moon rise as I braved Food Truck Friday … sitting on Art Hill to watch Ferris Bueller’s Day Off at SLAM’s Outdoor Film Series and seeing a gaggle of 20-somethings (and one gray-haired gentleman) jump to their feet and dance to “Twist and Shout” during the parade scene. With these memories and so many more in mind, I basked in the reflection of the Art Museum and then pedaled under the west footbridge and into the lagoon. There I encountered a wayward tree root. Fearful of getting stuck, I tried to edge around it, but it grabbed the bottom of the boat anyway. Caught, I paused. And then I remembered … the boats pedal backward! Right. Backward. In other words, these boats are not designed for merely toting a person from one point to the next; they are designed for enjoyment. Paddleboats are made for the slow lane, the scenic route, the back road. I unstuck myself and glided back underneath the bridge. On my journey back through the Emerson Grand Basin and Post-Dispatch Lake, I was in a reverie. I pedaled slowly. I moved with the water instead of working against it. I let the ripples on the lake mesmerize me as they troubled the glassy reflections of the trees. In short, I was entranced and unsure of why I ever wanted to hurry. I docked and cleared the way for Thursday night’s Moonlight Paddleboat Picnic preparations, extended through October 9 this year. This weekly summer event, now in its seventh season, offers boaters a chance to pedal after dark and enjoy a personalized picnic basket stocked with everything from cheese, fruit and brownies to mosquito wipes, solar lanterns and wine or beer. On the dock I met Sue and Fred Runner, married 30 years, who were about to embark on their second moonlight paddleboat ride. Thankfully, they already understood what it took me half a boat ride to figure out. It looks like good things come to those who don’t always want to work too hard, as well. 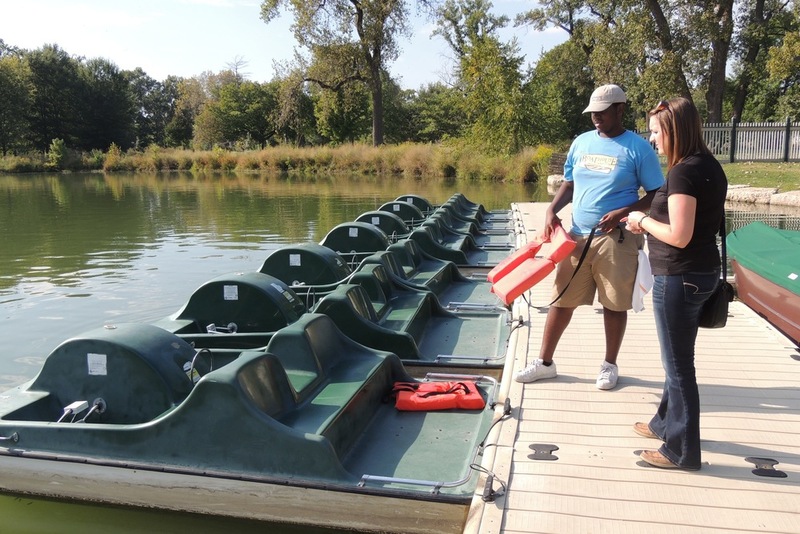 Paddleboats can be rented at the Boathouse for just $17/hour. Read the full details here.